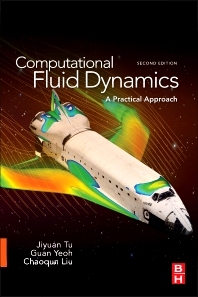 Computational Fluid Dynamics, Second Edition, provides an introduction to CFD fundamentals that focuses on the use of commercial CFD software to solve engineering problems. This new edition provides expanded coverage of CFD techniques including discretisation via finite element and spectral element as well as finite difference and finite volume methods and multigrid method. There is additional coverage of high-pressure fluid dynamics and meshless approach to provide a broader overview of the application areas where CFD can be used. The book combines an appropriate level of mathematical background, worked examples, computer screen shots, and step-by-step processes, walking students through modeling and computing as well as interpretation of CFD results. It is ideal for senior level undergraduate and graduate students of mechanical, aerospace, civil, chemical, environmental and marine engineering. It can also help beginner users of commercial CFD software tools (including CFX and FLUENT). 1.1 What is computational fluid dynamics? Guan Heng Yeoh is a professor at the School of Mechanical and Manufacturing Engineering, UNSW, and a principal research scientist at ANSTO. He is the founder and editor of the Journal of Computational Multiphase Flows and the group leader of Computational Thermal-Hydraulics of OPAL Research Reactor, ANSTO. He has approximately 250 publications including 10 books, 12 book chapters, 156 journal articles and 115 conference papers with an H-index of 33 and over 4490 citations. His research interests are computational fluid dynamics (CFD); numerical heat and mass transfer; turbulence modelling using Reynolds averaging and large eddy simulation; combustion, radiation heat transfer, soot formation and oxidation, and solid pyrolysis in fire engineering; fundamental studies in multiphase flows: free surface, gas-particle, liquid-solid (blood flow and nanoparticles), and gas-liquid (bubbly, slug/cap, churn-turbulent, and subcooled nucleate boiling flows); computational modelling of industrial systems of single-phase and multiphase flows.